Used as a buffer between Boston and New French via Puritan dictate….. the Province of Maine/Acadia never had a chance to develop. As Anglican, non-conformists to the Puritan oligarchy and often either Catholic or sympathetic to Rome …. these pioneers were expendable in the eyes of the Boston don ! The fate of Maine was sealed when their protector, Sir Edmund Andros was imprison by the dons. While the William and Mary Charter of 1691 was one of the determinants in the fall of the Extreme Puritan cause — their abuse and damage to Maine still continued. Clark, Charles E., The Eastern Frontier : the settlement of Northern New England, 1610-1763. New York : Knopf, 1970. The Society’s first edition has a call number of F7 .C6 1970 on the 5th floor stacks. I have consulted it there. Also, hardcover & trade copies can be found at Abebooks & Amazon. This is a necessary book in the same way as L. K. Mathews’ Expansion of New England still is after 100+ years. However, as much new in-depth research has appeared in various journals, it probably ought to be revised by someone. It’s genealogical component is very good, unless you want to wade through every index in each of J. P. Baxter’s Documentary History of Maine. It has appeared in trade paper and so is available from Abebooks & Amazon, too. 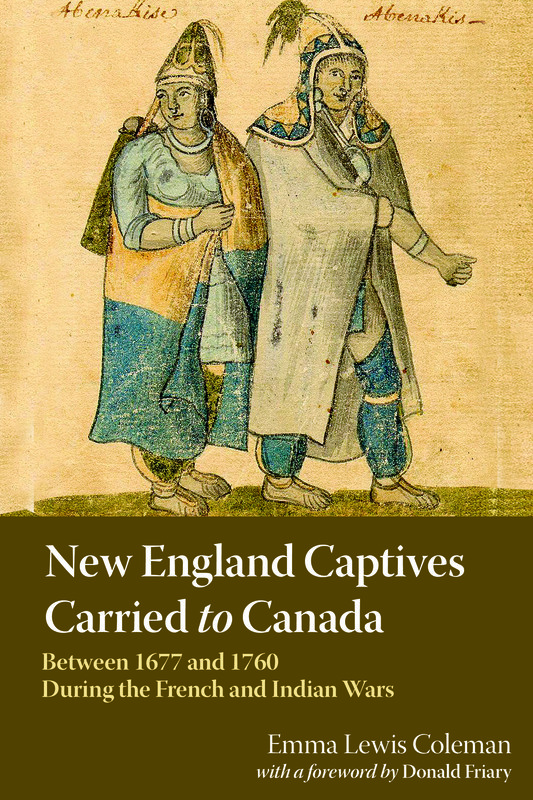 A very useful work still, especially for those reading New England Captives. For the French Perspective “Looking South”, I know of no single work such as the above. A good number of articles, with very strong genealogical components, on French Canada have been published over the last 20 years in the premiere American Colonial History magazine, William & Marty Quarterly. The Society has its entire modern run, as do many public libraries (consult World Catalog for those nearest you). Also, it is now searchable online by keyword and article title through JSTOR, though paying them for a copy is an arm and a leg, but free if you have an academic pass and your college/university subscribes. Banks, Ronald F. Maine Becomes A State: The Movement To Separate Maine From Massachusetts, 1785-1820. 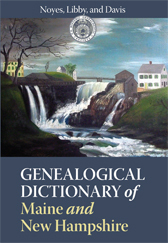 Middletown, Connecticut : Published for the Maine Historical Society by Wesleyan University Press, 1970. The Society call number is F24 .B35 1970. The first chapter covers the ground between 1763 and 1785. While the Dream of Norumbega/Acadia was strong in many people’s imaginations over nearly two centuries, especially in the Bay Colony (cf the Clark & Lake Proprietors, and Richard Wharton-Pejepscot Proprietors, etc), the reality on the ground among the Riverine & Coastal peoples was — they went their own way, doing their own thing ALWAYS, and THAT they do to this day. What we’ve come to call the Puritan Oligarchy was just ignored–except when monies were needed to fight & defend against the Native-Americans. Then Boston was good for something! 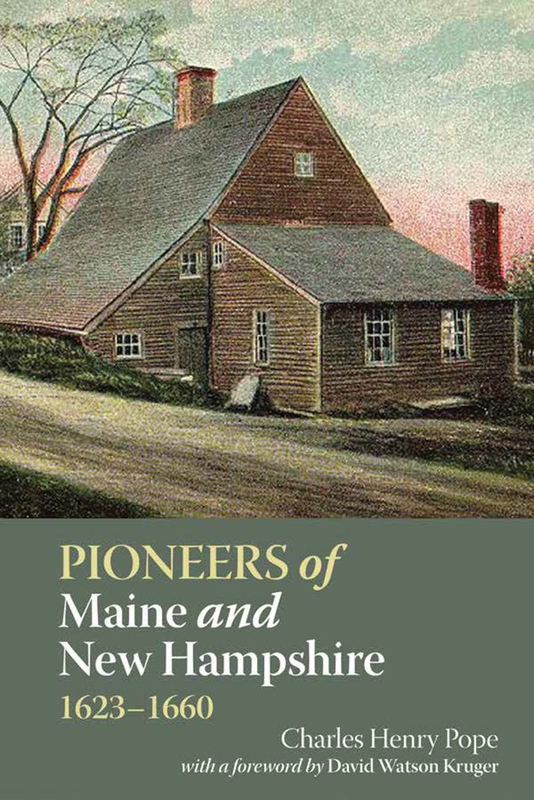 For a critical and must read work detailing the earliest English settlers of the Province of Maine—–Anglican and non-conformists to the Boston Puritan theocracy, alike —- none is more compelling than is the, “Pioneers on Maine Rivers” by Wilbur D. Spencer. (1930) 2006. 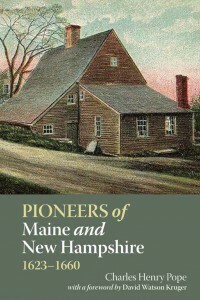 And for an overall review of the history of Maine from the long ignored French, Catholic and as well Anglican perspective no one has done a more accurate job than has the late Maine State Liberian, Herbert Edgar Holmes in his epic , ” The Makers of Maine; Essays and Tales of Early Maine History, from the First Explorations to the Fall of Louisberg, Including the Story of the Norse Expeditions”. (19120. Dave Dearborn’s cited comments, likely from this DGNE reprint’s introduction, give the game away re the uncalled for reprinting of Pope’s NH-ME Pioneers. It was the incompleteness and shoddy work by Pope and his hired researchers that spurred Davis, Libby & Noyes to achieve “one of the most thorough and exhaustive studies of an entire population every undertaken” and thus, for many, “the only source in which their names appear in print” so as to facilitate a researcher’s work. So “GO! GDNE.” Leave Pope to gather dust on its 6th Floor shelf space. The Society’s “shield” should decorate the front covers of books that are quality in content and add real value for the researcher, like New England Captives. And the “Society” should definitely let the late Harvard don Perry Miller lay in rest —- the Mass. Based Puritans were cruel tyrants and it took the Salem Witch Trials for the suppressed populace to finally figure this out!